TIM Series TUBE ICE Maker by I.T.C. is suitable for ice production factory and also for food processing plants that need to produce their own sanitation ice for their internal use. Internal water tubes of the TUBE ICE machine are stainless steel, no rust problem result in sanitary ice production for consumption. All components yield safety and efficient. The nominal capacity is based on 35 mm. ice size, other nominal capacity, please contact the manufacturers. The nominal capacity and its dimension varies accordingly based on the clients needs. Over the past years, ITC group has served the customers with top quality products, great services and reasonable prices. And now, it is great pride and joy for us to provide our customers’ satisfaction with our new “state of art” TIM Series Tube Ice Maker. 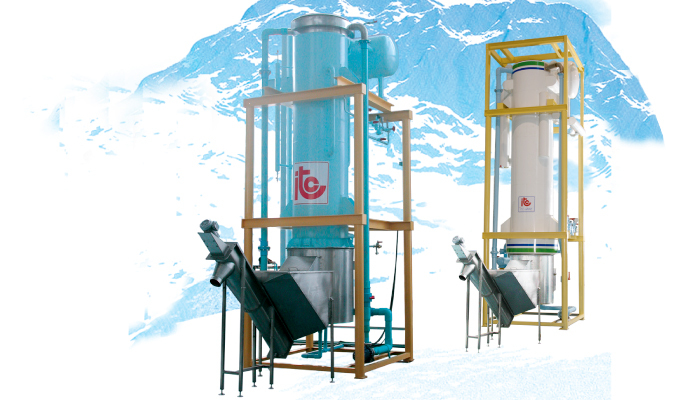 TIM Series Tube Ice Maker is really suitable for plant factories, food processing and other industrial companies. Also, it is extensively used in many fields such as restaurants, bars, fast-food industries, schools, offices, supermarkets and even healthcare purposes. Our Tube Ice Maker is so marvelous that various famous companies trust in its effectiveness and efficiency.